Homeowners with central heating understand there will, most likely, come a time when the unit will need central heating repair. Even with periodic maintenance checks and tune-ups plus the added annual service maintenance by a professional contractor, unforeseen things can happen resulting in costly repairs or the installation of a new unit. Be prepared for potential mishaps by understanding what type of system you have and what you may be facing in the future if problems arise. If you don’t know what types of central heating systems are on the market should you need to central heating repair & installation, or are wondering which one is best for you, here’s a breakdown of what’s available. This system uses natural gas or oil to create heat. A furnace is comprised of several components including a heat exchanger, blower, burners, and controls. A gas furnace, also referred to as a forced-air heating system, fires when the thermostat drops below the programmed temperature. The system then ignites a burner. As heat is created inside the chamber, it moves on to the heat exchanger then through the home’s ductwork to individual rooms. Gases are expelled from the home through a flue. Heat Pumps are best used in moderate regions, a heat pump features a better alternative to energy efficiency than a furnace. During the cold months, heat pumps, powered by electricity, move the cool air from the outdoors to the inside of your home. It does just the opposite during the warmer months. The moving rather than generating heat process of a heat pump makes it less expensive to operate than traditional heating appliances. With this system, a boiler heats the air, which is then dispersed throughout the home via ductwork and exits through wall or floor vents. A warm air system can also be fueled by natural gas, electricity, geothermal, or heat pump. Radiators might be considered by some homeowners as old school but they are energy and cost efficient. One thing to keep in mind when contemplating central heating repair is that once the contractor determines the extent of the repairs involved, you may be faced with the decision to replace the unit versus repairing it. In some instances, the cost of repairs can equal or exceed the cost of a new system. If this is the case, discuss your options with the contractor so you aren’t throwing good money towards fixing a bad system that may not run at its top peak or have a short lifespan. 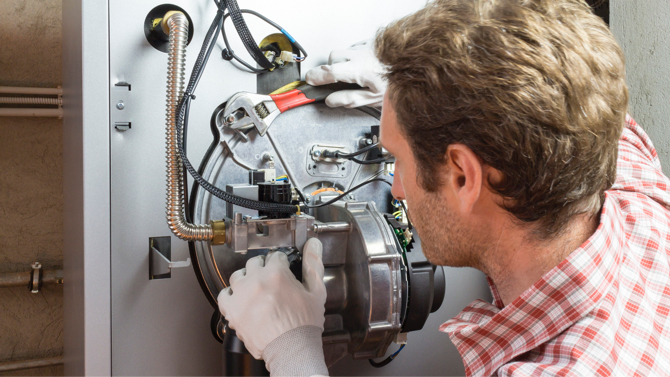 Once the contractor has inspected the system and determined what is needed for your central heating repair project, and depending on the type of central heating system currently in your home, the contractor will then address the problems which can range from leaking valves and loose wires to broken thermostats and frayed wiring. Homes using central heating systems that disperse air through ductwork may also need to have the ducts repaired at the same time, especially if it’s determined the ductwork has been damaged and is not functioning properly due to age, or a natural disaster. Normally, ducts will remain intact without splitting or getting holes but if uninvited guests like mice, rats, squirrels, or possums access your attic, they can do a lot of damage to wiring, insulation, and ductwork. For this reason, have your ductwork inspected. While there are more than a few choices in central heating options, for simplicity purposes, this section will cover the basic steps you would need to take prior to having a central heating system installed. For the most part, the same information can be used regardless of which system you choose. With the help of a certified professional, the first thing needed is to size the home so that you buy a system that will do the job. For example, if you buy a boiler that is too large, not only are you spending unnecessary money upfront, you’ll lose out even more with higher utility bills because of heat loss. At the end of the day, you don’t want to spend money on a system that is too small to warm your home or too large and wastes precious heat. To help you in understanding the sizing process, there are free cost calculators available online that you can use based on several factors. With this information, you can compare it to the contractors estimates to be sure you’re both on the right track to buying the central heating system that works best for your home. When sizing the home, you must take into consideration there will be heat loss in certain areas. Regular doors, sliding glass doors, windows, and exterior walls lose heat during the winter months. If any areas can be addressed prior to sizing, such as installing new sealing strips around doorframes, replacing or repairing a threshold, filling holes, and caulking cracks and crevices, make the repairs. It can save you money on energy costs throughout the year. If a new system is being installed for the first time, determine where it is to be located. For example, if you choose a system that uses an indoor air handler, measure the area where it will reside to ensure there is enough room to work if future repairs are necessary. Once you’ve done the things you can do, the next step is hiring the contractor who will take care of the rest. The installation processes the contractor may complete, depends on the type of central heating system including such things as laying copper pipe for water lines, wiring a thermostat or control panel to manage the unit, installing valves, laying a base for an outdoor unit, connecting gas lines, and installing all of the necessary equipment. Once everything is connected, the contractor will run a thorough system check to ensure all parts of the central heating system are running and heating each room as they should. Use common sense when it comes to maintaining a central heating system. Do periodic visual checks to ensure there are no leaks, cracks, broken wires, or blocked vents. 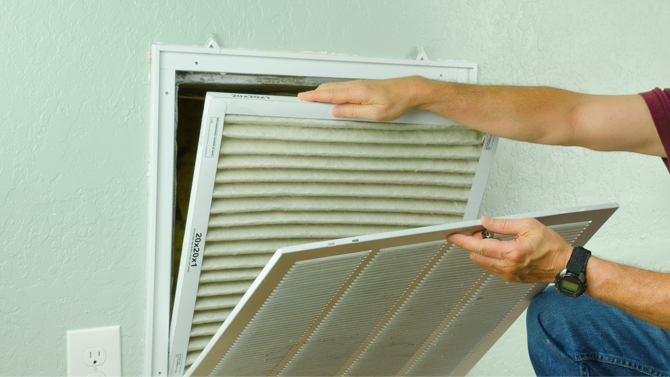 Don’t allow anything to block the air flow to the unit, listen for any unusual noises, and if your home isn’t as warm as it should be, call in the professionals. For homes with ductwork, this is another area that needs to be checked. With an annual inspection by a professional, it can be determined if the ductwork is up to par, if it needs to be repaired or replaced. Having the ducts cleaned is also an option as dust, dirt, dander, and allergens can build up and then be dispersed throughout the home once the system is in use. Another area that needs to be kept clean is the vents, also called registers. The openings need to be devoid of any debris for free-flowing clean air. Treat your central heating system to a service check-up once or twice a year preferably before summer temperatures soar and again prior to cold winter weather. Your service contractor will advise you on the frequency necessary for your particular unit based on the size of the home and the amount of usage. As with any major repair or installation of central heating systems in your home, it is always in your best interest to rely on the experience and expertise of a licensed contractor. A professional, certified contractor not only has the knowledge and experience to know the who, what, how, when and where of central heating repair and installing a central heating system, they’ll also have the necessary tools, equipment, and qualified helpers to do the job properly without taking any unnecessary. Choose a qualified contractor using referrals from friends and business associates who can vouch for the work. If that isn’t an option, contact several local companies and schedule an appointment with each for a free estimate. Once you choose the contractor for your project – and keep in mind the most expensive estimate does not necessarily mean you’ll get the best service – validate their credentials before signing any agreements. Central heating repair and installation can put a dent in your bank balance but over time, it is well worth the investment. During the coldest months and the hottest seasons, your home will remain comfortable and with a quality central heating system installed, it will be cost effective, too. The key to having your central heating system repaired is to do your homework and understand what is the best option for you. If you’re losing money due to heat loss from an old unit, it may be time to forego the repair and invest in having a modern and more energy efficient and cost effective central heating system installed.